The American Broadcasting Corporation (ABC) here in the United States has begun running a mini-series that is supposed to be a continuation of Shakespeare's Romeo and Juliet, picking up from shortly before the end of that play and giving the viewer an idea of "what happened next" between the Montagues and the Capulets. So, yeah, it's basically a major TV broadcast network giving us some summertime filler in the form of what I call "Shakespearean fan fiction." I am speaking, of course, about Still Star-Crossed. Why am I writing about this here, on a heraldry blog? Well, because they put some heraldry into it, and I thought I'd do a little research into the arms being shown on screen and share the results of that research with you. 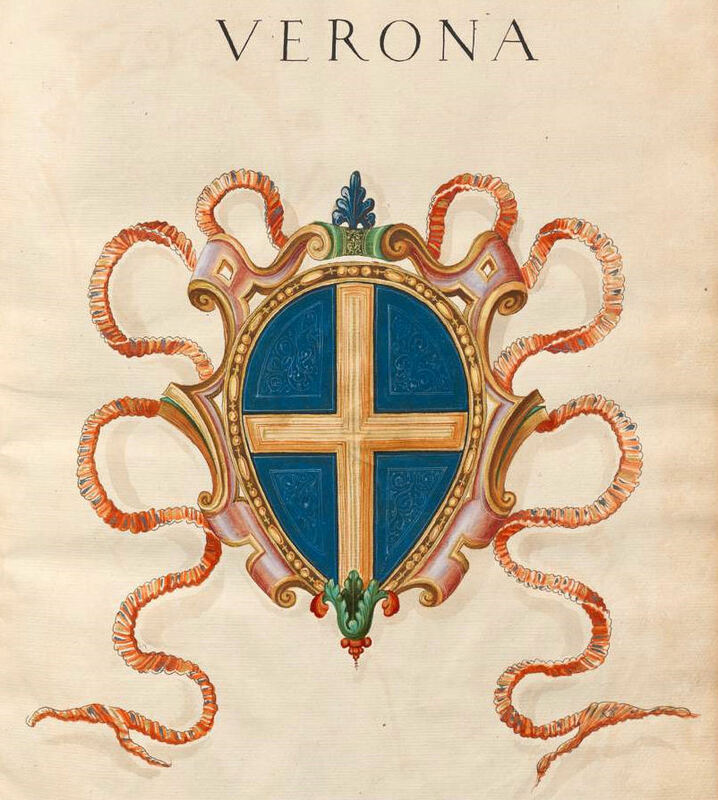 First off, we are shown what I have to assume is the arms of Verona, in the person of the Prince, which have been embroidered onto a large wall hanging behind his throne, and which I would blazon as Gules a cross or. So, blue field, not red. But at least they got the cross correct, so that's something, I guess. I would blazon these arms as Or a tierce azure ermined or overall a griffin segreant contourny or. But this shield is nothing like any of the several variants of the arms of the Capelli and Capello families of Verona and elsewhere. (The name went through a couple of variants on its way to Shakespeare; Dante, in his Divine Comedy, gave the name as Cappelletti, a diminutive of Capelli/Capello, and Shakespeare anglicized it to Capulet. Amusingly enough, some websites, like that of House of Names, tries to convince us that Capulet is of Anglo-Saxon origin, and is a derivative of Caplewood/Capelwood/Capilwode/Capulwode. On another page they say that the name is of French origin, while a third page there gives us some possible Italian origins. Always remember, people: Just because you see it on the internet doesn't mean it is true.) 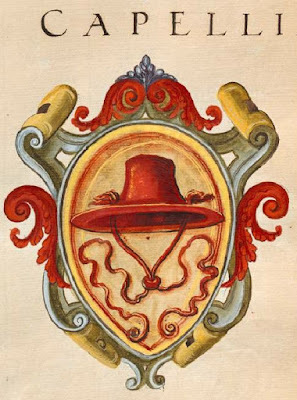 Most of the Capelli/Capello arms are canting, and contain a hat, or in some cases, three hats, on the shield. Nary a griffin to be found. Nor a tierce. And especially not a tierce in an ermine-type fur that is not found in heraldry of the period. Just sayin'. 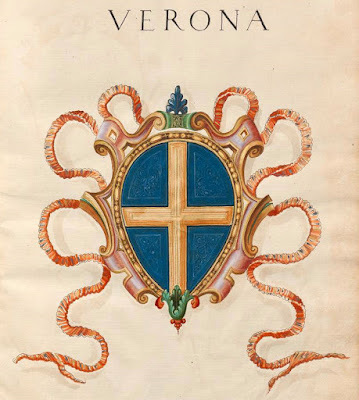 I was unable to find any real coats of arms for the family Montecchi (the name as given in Dante's Divine Comedy) or Montague (Shakespeare's anglicization of the Italian name). Nor have I run across any arms answering to this blazon. So there we have it, folks! Three coats of arms, for the three major players in this mini-series, two (the Capulet and Montague arms) made up out of whole cloth, and third, for Verona, with a red field instead of the correct blue one. Once again, we have it demonstrated unmistakably to us the difference between real heraldry and "reel" heraldry. It's a shame, really, because it's so easy to do it right.